Facebook Messenger has over a billion users, and gets 70-80% open rate in the first hour because it’s an engaging and convenient channel! With a ton of highly engaged users, Messenger is an ideal channel for setting up automated blasts of new content like blog or news feeds. 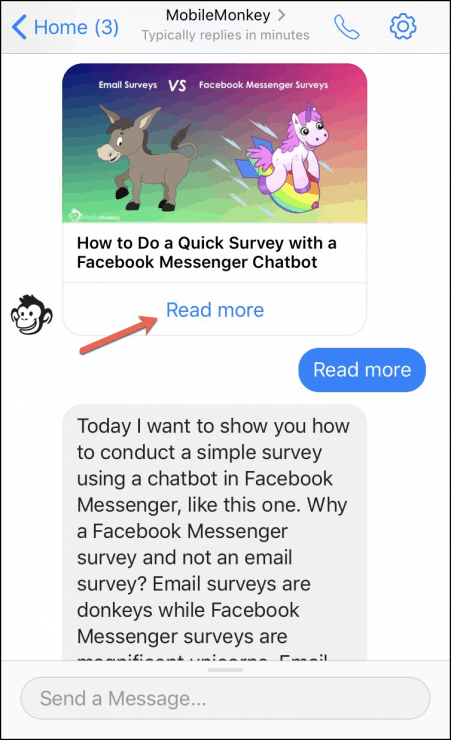 Facebook Messenger’s push notifications and mobile-friendly chat interface makes RSS Blaster for Messenger a no-nonsense way to send content in the most engaging channel. Keep your subscribers up to date with your latest published content through chat notifications in Facebook Messenger! to Send Automated Blog Updates with Push Notifications! Take advantage of Facebook Messenger notifications pushing your content to subscribers. Push notifications are highly visible alerts. And they make it easy for the user to click through to the message. No wonder chat is the channel with highest engagement compared to email, social media, search and any other digital channel! Mobile-friendly, never clunky, and always friendly on-the-go. We love Facebook Messenger because it’s chat designed for the mobile experience, not as an afterthought. When a subscriber taps the “Read more” button, that interaction in an engagement that tells Facebook and MobileMonkey that they want to see more of your content. In Messenger, your content becomes an engaging touch point with your readers. Set Up the RSS Feed and Let It Run! 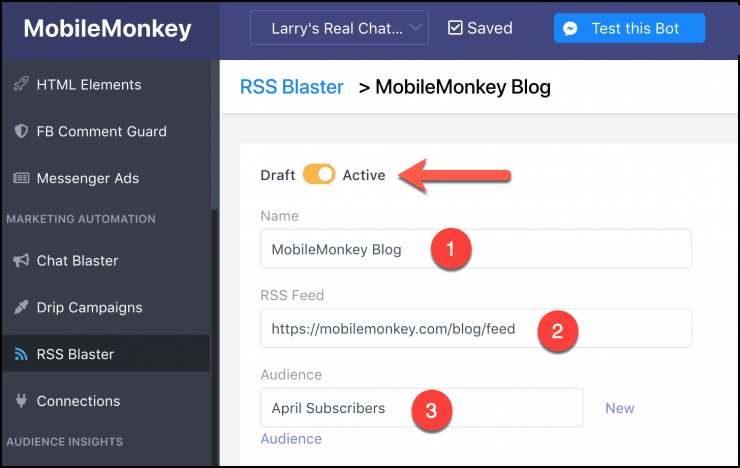 When your RSS feed updates, the chat blast is automatically sent to your selected audience — no manual effort after you’ve set up the RSS Blaster! It’s easy as banana cream pie to set up RSS Blaster. Just name the blast, paste in the RSS feed URL and choose your audience from the convenient drop-down menu! Flip the switch to activate and it’s on! RSS Blaster is so easy to set up! Send your subscribers updates in Facebook Messenger’s engaging, mobile-friendly format with visible push notifications. Than Email Using Chat Blasts for RSS Feeds!